After retiring from roller derby, Nikki McGuinnis began running to keep her mind and body active. She quickly fell in love with the sport and in just a little more than one year, has already done a few 5ks and half marathons. 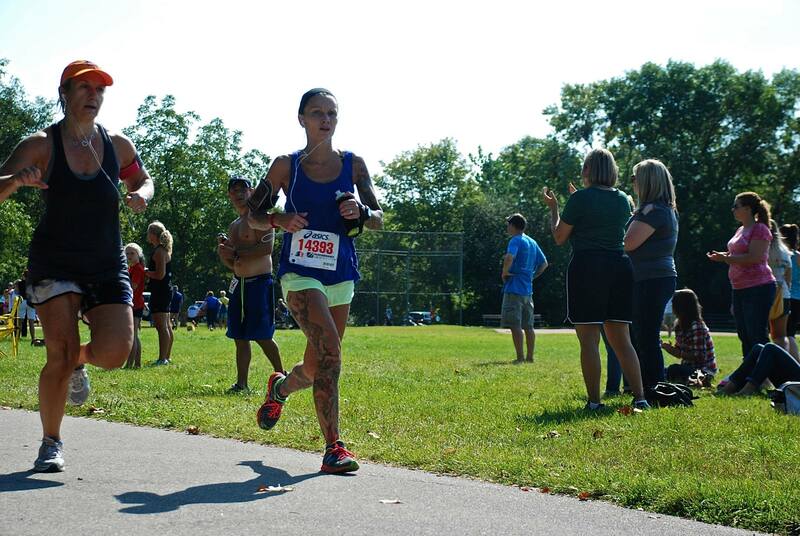 Read on to find out how she got into running, her favorite spots to run and her ambitious goals for 2014. Years running: I am still a running newbie! I’ve only been running consistently since June of 2012, so 1 year and 4 months. Favorite workout: I love running so that’s mostly all that I do for workouts. I pepper that with yoga and dog walks. Favorite distance to race: So far I really like the longer runs … longest I’ve done right now is a half marathon so I guess that would be my favorite. I’m really looking forward to 2014, when I plan to run the marathon and 50K distances. Favorite song to get pumped up pre-race: I love Jay- Z’s “On to the next one” and Bjork is great! I’m not too picky about my music I just like to have background noise when I run. What gets me most pumped up for races is all the surrounding energy. Runner energy is contagious and amazing! Favorite post-race treat: Hmmm … any food. I don’t drink beer so I’m all about the foods. I really like comfort foods like mashed potatoes, bread and pizza. Anything bread related really. However, I eat the same no matter what so I guess I can’t really consider any of that a “treat”. Haha! Must-have gear: My music, some sort of anti-chafing product and Lululemon’s run speed shorts. Once I found those shorts I’ve never gone back to any other. They are the best! I started running because I needed something to keep my body and mind occupied once I retired from roller derby. First I tried rock climbing which is fun, challenging and amazing but there’s an awful lot of prep involved. I wanted to do something that was less high maintenance. So I started running. I HATED every minute of it at first. Then something happened and it became physically easier for me and I began to enjoy the freedom and me time. I feel alive when I run and accomplished when I’m done. It has helped to calm my mind in a way that I’ve never experienced before. The plan is to run until I’m physically incapable of doing it anymore… so maybe when I’m dead. Running has changed my life dramatically! I have learned so much about my limits (or lack thereof), as well as been embraced by the running community in a way no other sport has embraced me. I think that runners are some of the most amazing and nicest people a person could ever meet. I wish I would have started running in high school. Running is my church. It is my time to engage with the earth around me and give thanks for everything I have and everything I’ve been blessed with. It has replaced hours of sitting in front of the TV, as well as changed my eating habits because I no longer crave certain things but instead crave other things that are better for me. Running has given me goals that I consistently strive to achieve, as well as introduced me to really wonderful people. Well I’m currently injured so I’ve not done much running the whole month of October. Typically though, I run 3-5 times a week in Lapham Peak on the black route, which is approximately 6.7 miles. If I don’t run all 5 days in Lapham then the other days are run around my neighborhood, which has some pretty great hills (aptly named “The Hills of Delafield”). I do my 6 or so mile runs there. Friday and Sunday are my rest days. Friday so that I have time to do something fun with my family and Sunday simply because it comes after my long run (10-18miles) on Saturdays. On Saturdays, I can often be found on the Glacial Drumlin Trail heading west towards Dousman because the trail is truly breathtaking. It is never very crowded and the foliage is such that most of the time you don’t even realize you’re right next to civilization. I am incredibly fortunate to live in Delafield where we have so many beautiful running options. You’ve mentioned your love of running the Lapham trails – what do the trails provide that can’t be found on the roads? Fantastic question! As I mentioned before running is my church. Trail running requires diligent attention to detail. I have to be fully engaged and present in the run where on road runs I just zone out and go inward to my life checklist … groceries, family needs, work things, etc. When I run on the trails I am not doing anything else. I am communing with nature. I am watching my footfalls and listening to my body. There is nothing better than running trails … no road run can compare. Do you have any tips for newbie trail runners? Pay attention to your feet! I have fallen more times than I care to admit because I was watching oncoming runners (pretty awesome falling flat on your face as other runners are coming towards you), fiddling with my iPod, or simply looking at deer or the scenery. It is important to note where you’re landing because there is always that odd rock (how I managed to injure myself this time), branch, root, or other debris that can injure or trip you up. Walk the uphills if you feel you need to. I think a lot of people think there is shame in walking the uphills, but in Lapham there is a hill that is 0.87 of a mile and it is a beast! I have run it completely before but really… it doesn’t affect one’s final time much if you’re walking the uphill compared to trying to run it and feeling like you’re dying inside after. Don’t be afraid to run the trails in the rain/snow. It is a whole different experience and a magical one at that! Nature is so amazing! Some people prefer to train solo, while others always run with a friend or two. What is your preference and why? I used to only run alone because I thought I was really slow and didn’t want to be a burden to another runner. Now, though, I love both ways for different reasons. I love solo runs because I don’t have to concern myself with keeping pace with another person. I can just fly and be free and not have to worry about either keeping up with someone or making sure I’m going slow enough for them to keep up with me. On the flip side of that, I love running with other people because (if they’re slower than me) it helps teach me patience and to love the easy run and (if they’re faster than me) it helps me to improve and push myself beyond what I would do if I was alone. I love being able to spend time with people in this way, too, because it’s about the only socialization I get outside of work. So going for a run with someone else is crucial because I get quality social time out of it. I loved the Rock ‘n Sole Half Marathon! Going over the Hoan Bridge was a really great novelty for that race. The Vince Lombardi Cancer Run/Walk 5K was so much fun! It is held on the grounds of the Milwaukee County Zoo and you get to run past all the animals! It was really a treat to do that one. The Brewers Mini Marathon is another amazing one! The race takes you past so many places that are special to Milwaukee. 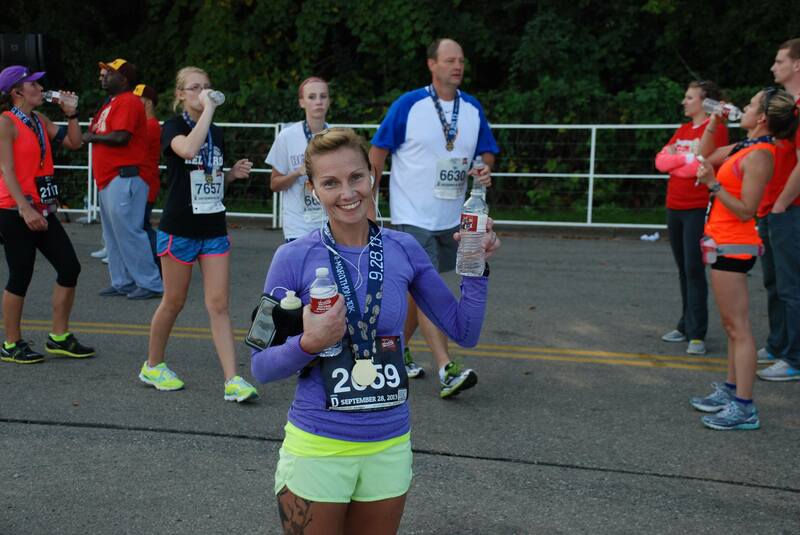 I am looking forward to doing the Milwaukee Lakefront Marathon in 2014, too, because that course sounds equally as breathtaking! I went to high school in Mequon so I know that area pretty well and am excited to run a race that will take me from Grafton to the Lake. I’ve got some pretty lofty goals for 2014. I’m planning on running my first 50K (Glacial 50K and/or Ice Age 50K) and my first marathon (Trailbreaker and/or Milwaukee Lakefront Marathon)… and more than one of each. I’m not planning any 5Ks just yet, but I really enjoy racing in races I’ve done before so I can measure my progress. Under this guideline, I will probably do the Vince Lombardi 5K and the Colorama 5K again. I’ve already got Rock ‘n Sole, Madison Mini and the Bear Trax 20K on my roster for next year. Unfortunately, so many races don’t have their registration ready yet so I can’t be certain how my schedule next year will shake out. I’m signed up for the three races I mentioned and then I’ve got a whole list on my blog that I wish to run. Hopefully injury will stay away and I’ll complete all those goals. I really just plan to focus on distance and trail racing in 2014. Also, if you haven’t already, check out enter our Drumstick Dash race entry giveaway! There are still a few hours left to enter. Best of luck! This entry was posted in MKE Runners and tagged MKE Runners, Nikki McGuinnis, Running in MKE, Trail Running. Bookmark the permalink. You’re welcome – thanks for sharing your story!